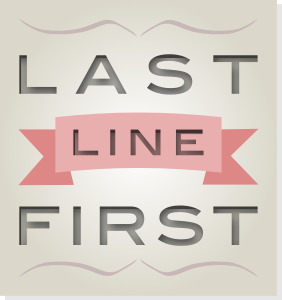 Welcome to Last Line First, a flash-fiction-writing challenge. Every Monday, I post the last line of an existing story for you to use as a prompt. You then have until midnight (BST) on Sunday to write and submit a ≤200 word flash-fiction that starts with the given last line. To officially participate, you must submit your story by posting it as a comment to the challenge post. You may tweak the last line in whatever way you see fit. The story can be in any genre (except graphic horror or erotica) and does not need to reflect the source story in any way. There will be no judging as such, but each week I’ll choose my favourite last line from the stories submitted. 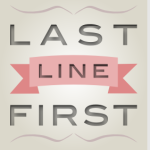 The author of the chosen last line will receive a Last Line First badge (pictured above) and see their last line used as a prompt in the future. To keep things simple: by submitting your story, you’re agreeing to let me use its last line as a future prompt. Thanks! You can find the latest challenge here and a list of my favourite last lines below. Week 1: His eyes are full of the things he’s seen, his mouth is full of stories. From Time Enough by Voima Oy. Week 2: They will never, ever learn that lesson until it is too late. From The Last of the Battle Queens by Nat Newman. Week 3: You’ll know better next time. From Fairground Initiation by Denise Sparrowhawk. Week 4: I don’t believe in love at first sight, but … From The Blind Date by Kirsty. Week 5: Sometimes you feel like you’ve just saved the world. From Killing to Save by Paul Kohn. Week 6: Why do people do what they do? From Why? by Paul Kohn. Week 7: My weakness is my biggest regret. From Shadows by Kirsty Lee. Week 8: Feather weight champion of the world. From Strength by Nick Black. Week 9: If I left tomorrow, would anyone even know? From Nickname by Paul Kohn. Week 10: She clutched the book to her breast and cried. From Void by Denise Sparrowhawk. Week 11: Some things are so special that they are just indescribable. From No Words by Paul Kohn. Week 12: Some days I love this job. From The Indescribable Girl by Voima Oy. Week 13: Their screams are music to my ears. From Charlotte‘s story. Week 14: Time to turn up the volume. From To Rest by Jacki Donnellan. Week 15: Today the still small voice must be heard. From Stillness by Denise.